My husband and I rarely go out to eat but when we do, we always want the experience to be worthy of our time and money. 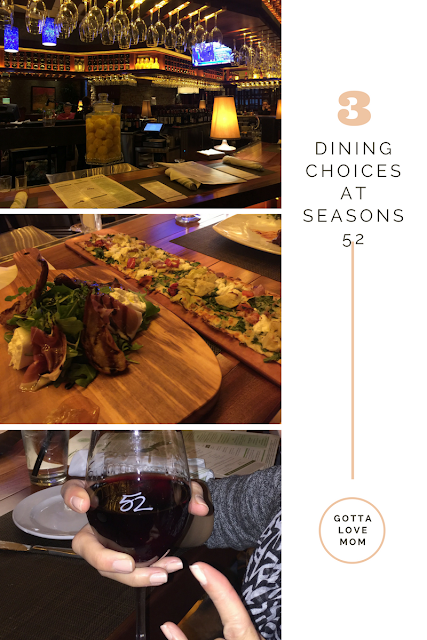 Last summer, we discovered Seasons 52 by the Menlo Park Mall. We were greeted with a warm welcome when we walked in. We didn’t have reservations so we sat at one of the booths at the bar. Our waiter was very attentive. The drinks, food and dessert didn’t disappoint. The tab was less than $100. We were so pleasantly surprised that we left a tip higher than the normal 20%. A few months later, we brought my daughter and son-in-law for her birthday – and the dining experience was another memorable one! A few months ago, we got together with 4 other couples, and again, we were pleased. If we had known ahead of time, we could have booked a private room for our group, for a minimum tab of $500. However, what got my husband and I excited was the happy hour, also known as “Sunset at Seasons”, which is daily from 4pm to 6:30pm. Last week was our 3rd time dining during happy hours. Although our usual spot at the bar was taken, the dining experience was as good as the first time. We sat at the bar, listened to live music (singer and keyboard) and ordered the following for just $33! I'm 52 years old and I can't help but smile every time the bar tender handed me a glass with my age on it! Last month, we "celebrated 22 at 52 for under $62!" which included our favorites: flatbread, wings, wine, meatballs, lamb chops and Seasons 52's signature drink, the organic sunshine martini. In the past, we splurged and spent $99 – with an additional cocktail, 4 more small plates including the spicy duck wing lollipops, and 2 scrumptious mini desserts. According to this store, these shoes are vegan, handmade, animal welfare and fair trade. This is the new Apple store in the mall, Hubby and I were curious how they close the doors at night. What about you, have you been to Seasons 52?